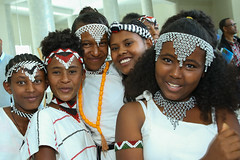 NEW YORK/ADDIS ABABA, 8 March 2016 – A new multi-country initiative to accelerate action to end child marriage will help protect the rights of millions of the world’s most vulnerable girls, UNICEF and UNFPA said on International Women’s Day. The new global programme will focus on five proven strategies, including increasing girls’ access to education, educating parents and communities on the dangers of child marriage, increasing economic support to families, and strengthening and enforcing laws that establish 18 as the minimum age of marriage. In Ethiopia, two in every five girls is married before the age of 18 and this practice is prevalent across all the regions. According to the Ethiopian Demographic Health Survey (EDHS) 2011, 41 per cent of girls between the ages of 20 to 24 are married by age 18, compared to 7.3 per cent of boys. Similar source also indicates that 63 per cent of girls between the ages of 25-49 are married as compared to 13.55 of men. The median age at first marriage is 16.5 for women age 25–49 compared with men who marry later, at a median age of 23.2. In terms of regional variation, the highest prevalence rate is in Amhara (44.8 per cent), followed by Tigray (34.1 per cent), Benishangul-Gumuz (31.9 per cent) and Addis Ababa at 32.3 per cent. From the 1997 baseline survey up to the follow up survey of 2008 of EGLDAM, the highest decline is observed in SNNP regional state where the prevalence rate declined from 18.7 per cent to 9.9 per cent and in Benishangul-Gumuz where it declined from 50.1 per cent to 31.9 per cent. Nationwide, the legal age of marriage is 18. However two regional states namely Afar and Somali have not yet promulgated their regional family laws in alignment with that of the federal level. Thus, by implication, the legal age of marriage in these two regions is still below 18 and customary law condoning child marriage prevails. 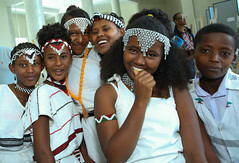 The Government of Ethiopia has taken strategic and programmatic measures to eliminate child marriage. Some of the key actions include; endorsement of the National Strategy and Action Plan on Harmful Traditional Practices against Women and Children and communication strategy for social norm change and establishment of the National Alliance to End Child Marriage and FGM/C to coordinate and synergize national level efforts. Moreover, the Government has shown a ground-breaking commitment to end child marriage by 2025 at the London Girls’ Summit and reinforced by setting a target to reduce the practice to 0.5 per cent in the Growth and Transformation Plan II (GTP II). 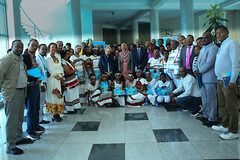 UNICEF is supporting the Government of Ethiopia in developing a roadmap which defines the long term strategic and programme interventions and the role of different actors, strengthening the National Alliance through supporting the establishment of functional secretariat, enriching the Ethiopian Demographic and Health Survey (EDHS) module to include better data and consensus building sessions with religious leaders in collaboration with UNFPA and other Alliance members. In addition, UNICEF is supporting the government of Ethiopia in implementing ending child marriage programmes in Amhara, Afar and Somali regions. Similarly, UNICEF and UNFPA have developed a joint programme to end child marriage based on the lessons learned from the successful implementation of the joint programme on the elimination of FGM/C. The key results of the joint programme include; enhancing girls’ capacity to better exercise their choice, changing the attitudes of families and communities to value investment in girls and enabling service providers to respond to the needs of adolescent girls. In addition, it focuses on ensuring alignment of existing legal and policy frameworks with international standards and allocation of adequate resource to strengthen the data management system. Most of young girls are still suffering from Child marriage and FGM; the child marriage victims are suffering on lots of impacts. I and other five volunteer young friends are working on Child early forced marriage and FGM as a #Youth for Change project to meet the 2025 government goal. The project is working in four countries, Ethiopia, UK, Bangladesh and Tanzania. The Ethiopia Team was visit the Amhara region, (the highest child marriage prevalent area) discussed with partner government and non government organizations about the issue, met with the victims and visit one rural keble that free from child marriage and talked with four young girls saved from the proposed child marriage. That was a good experience sharing for us. We are happy working with your organization, if we get the chance, since we are working on your program area.